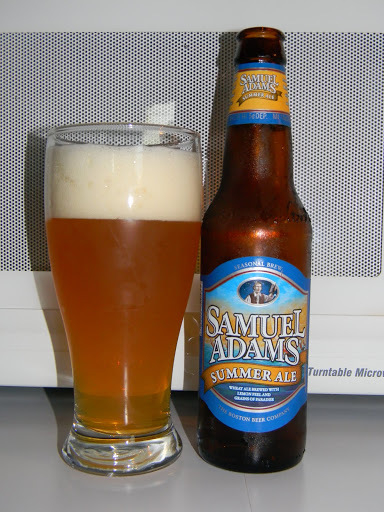 Review of Samuel Adams Summer Ale | Beer Apprentice - Craft Beer News, Reviews, Interviews and Info. For today’s craft beer review I thought I would review another Summer seasonal before all of the Harvest and Pumpkin Ales start hitting the shelves. How ’bout the Samuel Adams Summer Ale brewed by the Boston Beer Company located in Boston, Massachusetts? I’ve had this brew numerous times, yet have never actually given it a proper review, so I think it is about time to do so. The website, samueladams.com, has this to say about the Summer Ale. Bright and citrusy, brewed with Grains of Paradise. Samuel Adams Summer Ale is an American wheat ale. This summer seasonal uses malted wheat, lemon peel and Grains of Paradise, a rare pepper from Africa first used as a brewing spice in the 13th century, to create a crisp taste, spicy flavor and medium body. The ale fermentation imparts a background tropical fruit note reminiscent of mangos and peaches. All of these flavors come together to create a thirst quenching, clean finishing beer perfect for those warm summer days. Let’s give it a proper review. This brew has an ABV of 5.3% and comes in a 12 oz. bottle. The Samuel Adams Summer Ale poured a semi-clear, yellow/gold/orange color. A very bright, white head was formed that was of good size and had a somewhat soapy texture. The retention was so-so and the lacing was just ok.
With the aroma, I definitely got a significant wheat and lemon citrus note. It smells clean and fresh, but it sort of smells like dish washing liquid. Kind of soapy or something. Hmm. A slight honey hint hid underneath the citrus. It had a medium spicy nose of pepper (I guess that’s the Grains of Paradise). I didn’t find any of the peach or mango that was mentioned in the description. Oh well. Overall, I thought the bouquet was quite average. Nothing too complex or outstanding. The taste brought about a lemon citrus with some wheat characteristics. Very crisp and fresh. A touch grainy and a tad sour. Some spiciness of coriander and light pepper. Again, a small hint of honey was detected on my tongue, but still no peach or mango. Similar to the smell in that nothing really stood out to separate this brew from others that follow the same style. The mouthfeel was medium to thin, smooth, crisp, refreshing and thirst quenching. It was mostly watery and not a lot of flavor was left on the palate for me to enjoy. It vanished very quickly to tell the truth. Well…. this brew is super easy to drink and, obviously, fits the profile for a Summer seasonal, however there are much better examples out there in my opinion. With that being said, I could drink it if it were offered with no problem. This is a great “BBQ beer” and I could see this being a great introductory craft brew for someone wanting to branch out from the standard macros. It’s not bad, although it’s nothing outstanding either. So, with Summer starting to wind down, pick up a bottle of Samuel Adams Summer Ale and give it a go and let me know what you thought of it. Thanks for reading and commenting folks. As always, it’s much appreciated.